On a tour of the energy facilities in Salem Township, Forbes Road Volunteer Fire Department Chief Bob Rosatti stops at a Mariner East 2 construction site. The Slickville Volunteer Fire Department would have jurisdiction over an incident here, but the Forbes Road department -- just six miles south -- would provide mutual aid, Rosatti said. 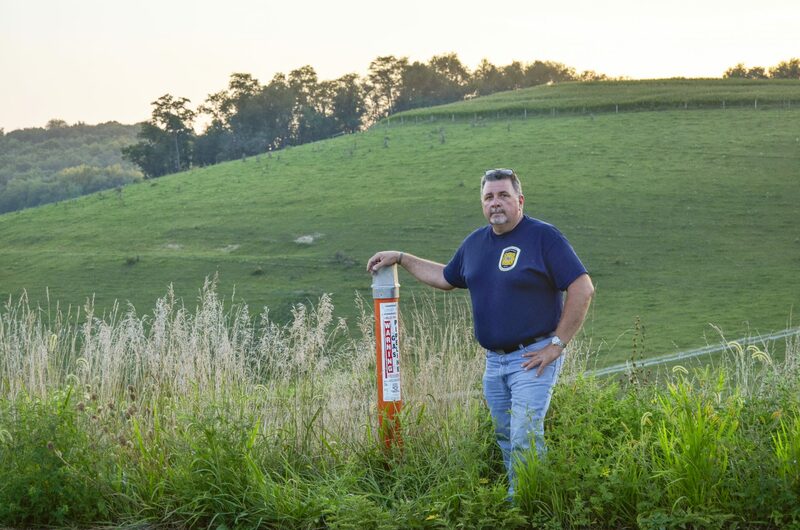 Chief Bob Rosatti of the Forbes Road Volunteer Fire Department stands alongside a marker for the Texas Eastern Transmission Pipeline, which exploded here in Salem Township in 2016. Every time Bob Rosatti drives the highway near his hometown of Forbes Road, he can’t help but think back to the explosion that happened here two years ago. On a recent trip, he pointed to a radio tower that juts out of the ground above a lush valley in Westmoreland County in western Pennsylvania. “The flames were way higher than the tower. You could not see the tower,” he said. The chief of the local volunteer fire department was at home down the road in the small community of Forbes Road when the blast occurred on an April morning in 2016. A segment of the Texas Eastern Transmission Pipeline, which investigators believe had corroded, was leaking natural gas. It ignited, sending out a roar that could be heard for miles across the hills. Rosatti hopped in his pickup and drove toward the noise. The blast destroyed a house and severely burned the man inside as he fled. Now, another pipeline known as Mariner East 2 has gone in a couple miles north and is about to be operational. Pipeline explosions are rare, but should one happen on that line, Rosatti and the rest of the Forbes Road Volunteer Fire Department will be among the first to respond again. On one hand, he’s prepared. “I’m very comfortable with the gas in the area because of the exposure and the training we have to it,” he said. On the other hand, a different product will pass through this pipeline. “I would be lying to you if I told you the propane doesn’t concern me very much,” he said. Mariner East 2 starts in Ohio and is slated to carry propane, butane and ethane to an export terminal in Delaware County. Those substances, known as natural gas liquids because they convert to liquid form when pumped through at high pressure, would turn into gas if they escape and would stay low to the ground until they disperse. Rosatti envisions the worst-case scenario would involve a major leak that forms a cloud a mile wide, then gets ignited. “It’s going to be one hell of a boom,” he said. If a pipeline explodes, it often falls to the pipeline company to stop its flow of gas. “The fire department is not going to be able to do anything as far as mitigating that leak,” said Patrick Pauly, who recently retired from the Pennsylvania State Fire Academy, where he administered the alternative energy emergency response training program. 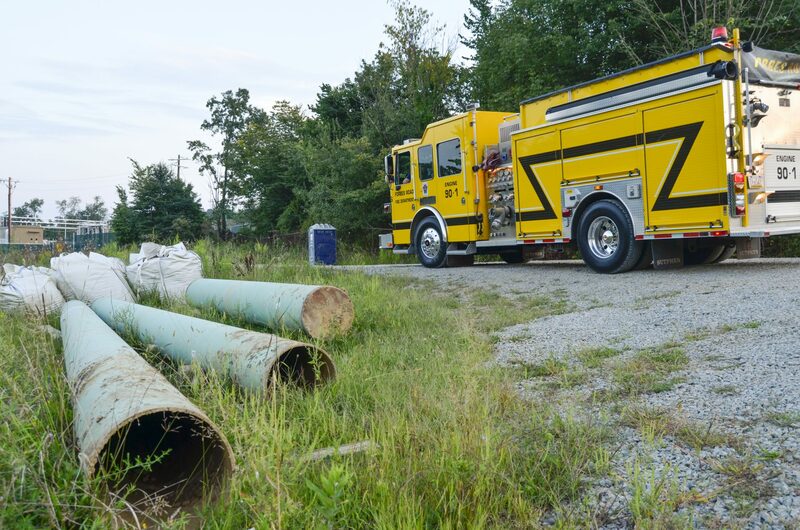 Firefighters don’t have specialized knowledge of how to operate the pipeline systems in their communities. An explosion might be so big or hot that they couldn’t get close enough anyway to try to put out the fire. Firefighters’ role often involves assisting the gas company and managing the area around the incident. “Evacuation may be necessary, depending on where it is at,” Pauly said. That’s how it played out in 2016. Rosatti’s department helped residents flee and sprayed water on homes to prevent them from catching fire, while workers for pipeline operator Spectra Energy closed valves miles away. The flames spewing out of the line reminded Rosatti of a blowtorch, but once that segment of the line was isolated, he said the flames calmed and looked like a flickering candle. “The line was shut down and we were just burning off the residual gas that was in the line,” he said. A spokesperson for Energy Transfer Partners, the company building Mariner East 2, said in an email that the majority of the new line’s valves can be controlled remotely. “We follow all applicable rules and industry best-practices regarding valve placement and automation, including using automated valves in sensitive areas and placing them at strategic distances — for which we performed extensive hydraulic modeling to ensure their correct placement,” spokesperson Lisa Dillinger said. With the new pipeline coming through, Rosatti and 16 others from his department attended a training last year hosted by Energy Transfer Partners. The company, which says its Mariner East 2 line will be operational this fall, is building a series of Mariner pipelines. More than 2,000 first responders have participated in trainings for them, according to a spokesperson. Dillinger said that the company “literally hired the guy who wrote the book on pipeline emergencies” to lead many of its Mariner East 2 sessions. That’s Gregory Noll, a Pennsylvania-based consultant and firefighter. In an email, he said the Mariner East 2 training teaches first responders where in their communities the pipeline is, the basic components of its operation and the physical properties of natural gas liquids. The training also covers potential incidents and how to take a “risk-based response,” which means analyzing the problem and assessing its hazards to determine what course of action to take. For example, he said, first responders need to consider a number of factors when sizing up an incident: Are there immediate life safety issues that must be addressed? Can responders safely approach the incident? Is the incident rapidly increasing in size or scope? Do responders fully understand the nature and scope of the problem? Noll is working with the State Fire Academy and operators to streamline the variety of pipeline trainings available to first responders in Pennsylvania. Pauly heads that effort, modeled after similar projects in Georgia and Oklahoma known as the Pipeline Emergency Responders Initiative. He hopes to launch a pilot training early next year, and ultimately offer sessions in communities throughout the state. It would be free to first responders, funded by pipeline companies and the state’s impact fee collected from natural gas producers. In Beaver County, several new pipelines are keeping director of emergency services Eric Brewer busy attending trainings, like on a recent September day. “I just came out of it about 10 minutes ago,” he said. The meeting, for a proposed Shell pipeline, was scheduled coincidentally for the day after a section of a different pipeline blew up in the county on Sept. 10. Energy Transfer Partners, the same company building Mariner East 2, owns that line. No one was injured, but it burned a home and knocked down power lines. 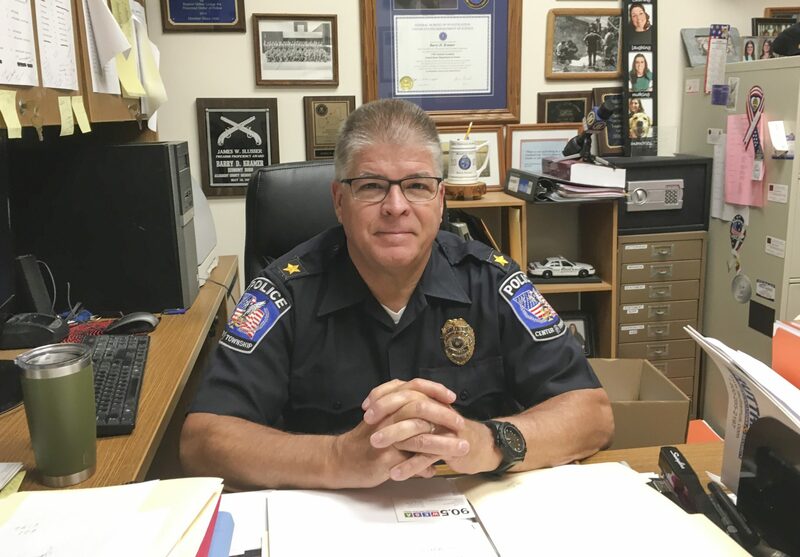 Barry Kramer is chief of the Center Township Police Department and oversaw the response to the Revolution Pipeline explosion Sept. 10. Center Township Police Chief Barry Kramer acted as incident commander in the hours following the explosion. The next day, he said the company was communicating well with him and had flown employees up from Texas to assist with the response. “Now the conversation shifts to, ‘OK, tell us, pipeline people, why this happened and assure us it’s not going to happen again,’” he said. Responders say they believe heavy rains led to landslide, which contributed to the explosion, but the state Public Utility Commission continues a formal investigation. Kramer said he didn’t know the line had gas in it yet, as it was new. A spokesperson for the Public Utility Commission said pipeline operators are not required to give notice to the agency when they start to operate a line. “Looking back, I think the company should probably say, ‘We have turned on that line,’” Kramer said. He doesn’t think notification could have prevented the explosion, but he said he believes it’s a good practice. He and Brewer — and Rosatti in Forbes Road — all have similar advice for first responders along the route of Mariner East 2. They say that step is key so that a catastrophe isn’t the first time pipeline operator and first responders meet.